One rabbit wakes up. Then another. In the magic light of the full moon they see stories reflected from another world. A world tied to their own, but far in the distance. Join the rabbits as they discover a bridge powerful enough to bring different worlds closer together. And the courage to cross it themselves. Be illuminated By the Light of the Rabbit Moon where stories can change who we are, open us up to our own stories and ultimately build bridges between worlds. 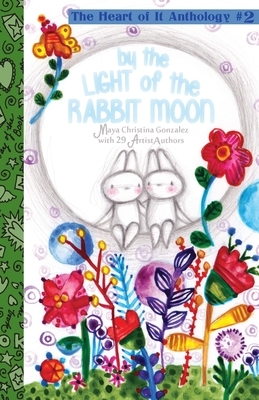 Continuing to stretch the concept of anthology, award-winning children's book artist and author Maya Christina Gonzalez takes us on another playful journey through story in this second book for the Heart of It Collection. A fresh and wordless tale spotlights the work of 29 new and emerging diverse children's book ArtistAuthors. Stories about nature, magic, identity and love abound. All provide seeds and possibilities to inspire kids to tell their story, share their art and know that in both the telling and the listening, our stories have the power to bring worlds closer together. Featured ArtistAuthors: Ale Barahona, Michelle Biyal, Victoria Bruno, Debbie Burran, Cecille Cervancia, Samantha Matalone Cook, Adrianne Beth Galvez, Silvia Garcia, Carol Green, Virginia Grise, TeMika Grooms, Teresa Lakier, Robert Liu-Trujillo, Nguyen Louie, Danielle Lucas, Ann Magee, M lina Mangal, Shanimarie Ogilvie, Gayle E. Pitman, Bernice Avella Popp, Nashanta C. Robinson, Karen Simpson, Roxana A. Soto, Carole Stedronsky, Yoly Petra Stroeve, Chantra Tham, Sonal Vyas, Cynthia A. Weber, Laurie L. Young.